Throughout production Yamaha basically installed the same charging technology. Rotor spun inside a battery induced magnetic field creating an AC current converted to DC by a slicone rectifier (6 diodes). Pre 80 models had a mechanical regulator controlling voltage before the rotor. 80 on used a solid-state rectifier/regulator combi which controls voltage after the rotor. These systems have provided reliable service for a long time now. Most problems stem from bad battery, worn rotor brushes, dirty or broken wire connections, dirty or worn ignition cylinder. If you have charging problems best fix it. Better sooner than later. A bad battery kills a good charging system. A bad charging system kills a good battery. Although easy to troubleshoot and repair good parts are becoming harder to find. Rewound rotors expensive and not necessarily reliable. 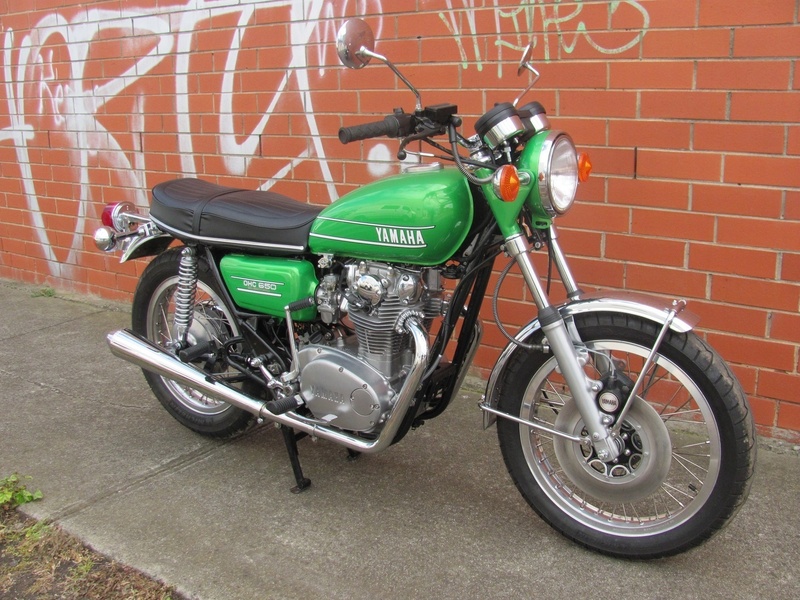 Earlier adaptations of later model RD350 alternators provided relief – but were still old. Advantages were instant current production and the ability to run battery-free. Today, off-the-shelf bolt-in kits are available. 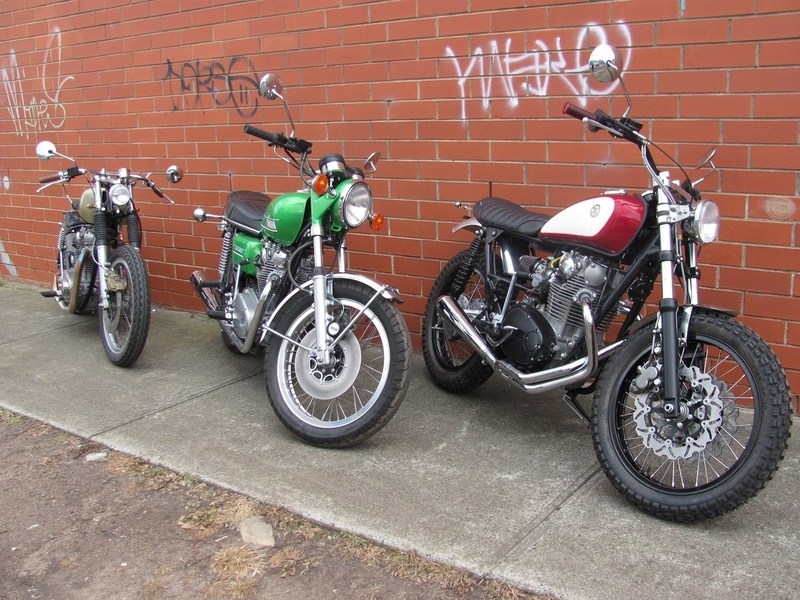 In the garage are 2 bikes with PMA conversions (1 an RD350 conversion, the other from Ants – both points), 1 with total loss, and 2 with original systems (1points, 1 Boyer). One of the original chargers, 79, with mechanical regulator has decided to rebel. Battery flat after a couple of hours riding, headlight on. I have a spare RD350 conversion boxed, in the corner. Do I put it in? If your battery is suspect, the ignition-block, fusebox or wiring damaged or dirty – nothing you do will solve your problem. When you are absolutely positive these are ok, check them again. This is actually most of your work done. What do you know about your bike? Curly rulz!! A quick Slap-test gives an indication how good your Regulator and Rotor are. I hang a 17mm ring spanner off a screwdriver, poition it close to the alternator cover and turn the key on. It should pull into the cover and release when the key is turned off. The more positive it reacts the better. Mine was good. Check voltage at your brushes. Green wire. Key on. Motor not running. It should be max. 0.3VDC less than your battery reading. Weak voltages create weak magnetic fields. Check your wires. Battery, earth, fusebox, ignition block. No real point in going any further until you solve this. First time I had 5.4VDC. Cleaning the 6 wire connector gave me 11.5VDC. Battery earth strap both ends sanded and washed, 11.9VDC. Battery +ve, heavy end to starter solenoid. red to fusebox and ignition-block. Washing the ignition-block out with brake cleaner and cleaning the brush connection gave me the rest. You may, now, only need new brushes. Check them. Min 7mm. The outside brush will be shorter than the inner. Its’ path each rotation is longer. I usually remove the stator. Gives direct access to the rotor. Meter on Ω, Ohms. Ring/Ring should be 5.0 – 5.5 Ω. Ring/Earth, infinity. Inspect for damage, discolouration. The dirtier and darker the windings the more likely the rotor is defect. Check the stator. Damaged wiring? Discolouration? Smell? Mine was quite oily. Where did it come from? Crankseal? Cable-pass hole? Gave a quick sqiurt with brake cleaner. Unplug the 6-wire connector. White/White should be around 0.5Ω. All 3 combinations. If not disconnct the single yellow wire and repeat (tests the safety relay). White/Earth – infinite. Plug together. Motor running. Meter to VAC. White/White 10.5-11.0 VAC. Low readings indicate a grounded Stator. High readings, a bad Rectifier. So, if you’re having problems with your original charging system don’t simply throw it away and get a PMA. Check it. When you find a problem keep checking – there may well be more than one issue. For me here, once I sorted the voltage at the brushes I was fine. A quick readjustment of the regulator and all was good – didn’t even need to replace he brushes. If you do decide to replace it, be aware that if you have electronic ignition you will need to replace that too. Ants produces a direct swap kit for points models that i am personally very happy with. Powerdynamo also have a combi PMA/Ignition. 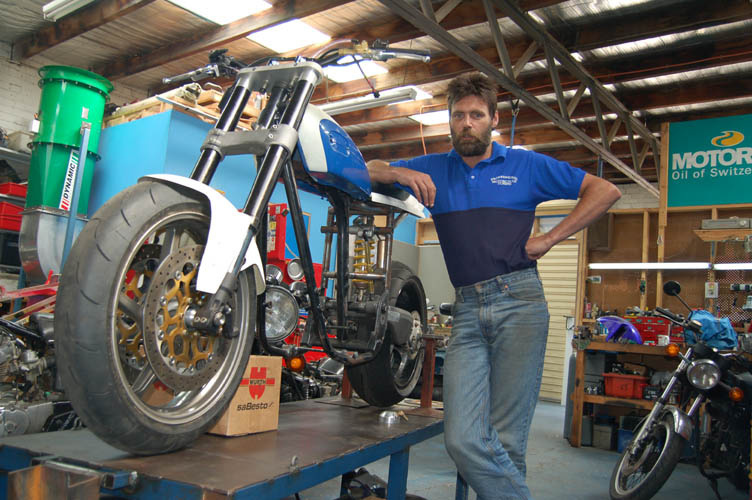 Sourced and installed the parts from an RD350LC PMA into my blue rat some years ago . Used. Old. And still good. Very happy with it. A year or so ago I picked up a nice low mileage 77 D. Ridden a few miles every year. Complete paper record. Had some charging issues. Was pretty busy for a while and it sat. Eventually got a chance to blow the dust off and begin. Checking that the stator screws were loctited in – Yes. Backing plate didn’t sit properly over the crankshaft seal boss so got busy with a file. Would have been quicker to head off to the workshop and chuck it in the lathe. Naya. Cut-out and reshaping will be now be done during production. Phase wires held in place with a clip. Used another on the plate screw to the right just to keep clear from the chain and secured cable with a frame tie just below the rear engine mount. This is the original regulator. Remove it. The rectifier too. Sits under the battery box. Remove the battery to release the rectifier. Made a plate to mount the new 5 wire rec/reg in the original reg position so the fins didn’t block the airbox inlet. Would have welded tabs directly to the battery box but had run out of wire for the MIG. The 3 screws with nuts create an air space under the rec/reg for cooling and better air flow to the filter-box. Packed with rubber bushes they dont rub against the underside of the rec/reg. Release the original connector blocks by inserting a small flat bladed screwdriver into the recess beside the pins. Simply push out. Make sure the tangs are reset before reusing. Added a 20 Amp flat bladed fuse holder in the positive battery feed. Just for security. This wire is too long and will be reworked. Just got to put some kms on her now to road test before installing a 750 kit that’s been sitting on the shelf for a couple of years. Had some charging issues in the beginning. Went through and checked the new wiring. Not quite sure what was wrong but the issues disappeared. More than happy with this. Ant’s: This is a good product – once I installed it, 2.5 years ago, I have had no problems .. !!KOOL!! 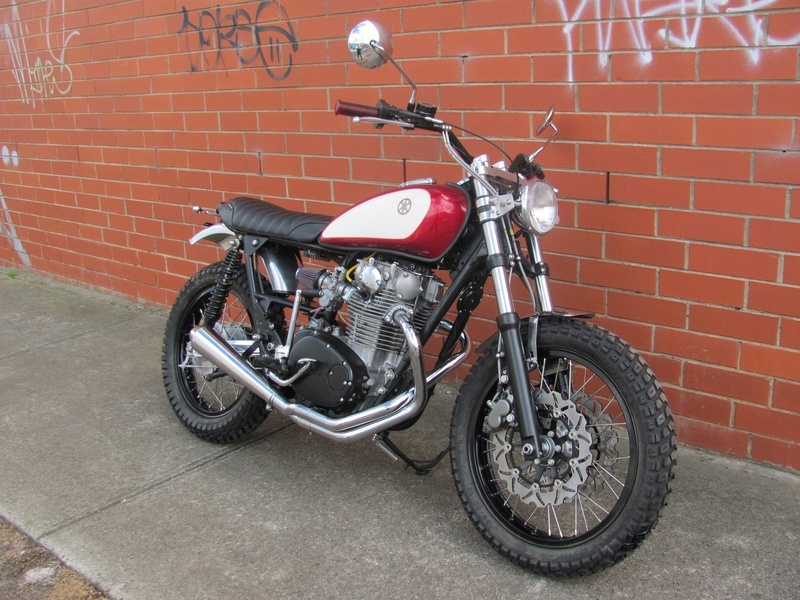 My first contact with Daryl was back when I joined the Australian XS650 Club. After finding Terry’s website. 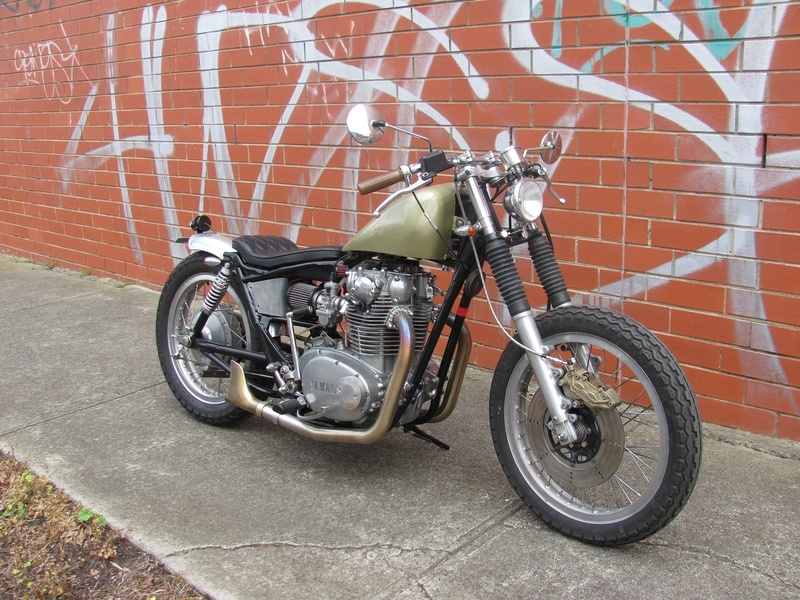 I had picked up an XS650 Special for a song. Had been sitting 10 years. Reigniting an association I had had with these beauties during the 70’s and 80’s. Funny how the worm turns. Connects. Was talking to a mate about my find. A warm far-away smile spreads across his face. Takes me out to one of his sheds. An 82 standard sitting in the corner. Sharing space with other beauties he hadn’t been able to part with. Naya, to cut a long story short – I started telling him about Daryl’s 270° rephase pins. We spent the next few weeks ‘touring’ around Europe (touring? – hmmm, hard physical work, long days, hotel beds – a dream). Boys back in town. Peter hands me a small package. Surprisingly heavy. You got it! 270 heaven. No looking back now. I’m converted. Wanted to do some remedial revision last year, to the 270 motor: clutch, gearbox, cam chain and a little headwork – ended up adding a 750 kit too. Checked the crank – no problems. Still, I added carrillo rods, balanced and welded it all together. Mum shat buckets of blood. This isn’t my story, so back to the point. Daryl isn’t just Mr 270. He is Professional Motorcycle Tuning. Melbourne (a truly beautiful town, Port Phillip, Yarra River, AFL and the nearby Phillip Island circuit to name just a few teasers – well worth a visit). Where to start ? At the beginning. I have, luckily enough, been able to do this most of the time. I moved to Melbourne, 1978. Worked as an apprentice electrician. I didn’t really like it. 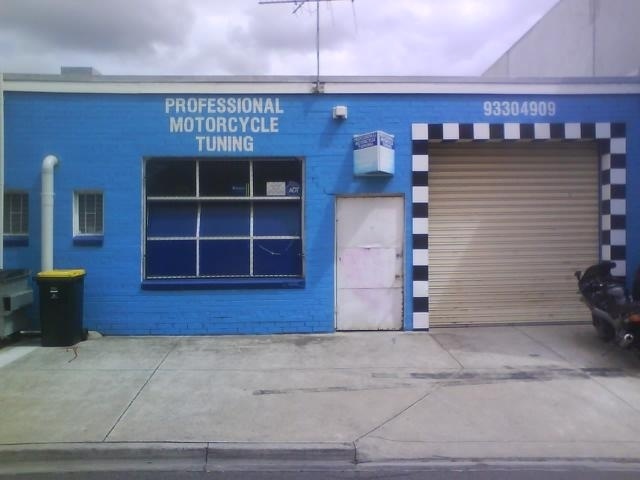 Spent most of my time at a mates motorcycle shop, helping. How I got my first XS650. An XS2. In a million bits. All in boxes. Engine totally dismantled.Forks removed, swing arm in another box. But, everything was there. Over the next few months we rebuilt the engine, installed the forks and swing arm, some new tyres, got some replica Dunstall mufflers and another mate painted thetin. Cool looking wheels. I rode that bike around Melbourne. Did a trip up to Sydney and back. Never missed a beat. I came out from my electrical job one afternoon and it was gone. I thought the guys I worked with might have moved it on me as a joke, but no, it was stolen. Called the police. They didn’t really care. Never found it. Only had one photo of it – long lost. I really liked that bike. After finishing my apprenticeship, 4 years, I joined the army for 3 years. Since then, I have been involved in the motorcycle industry, working as a mechanic until becoming the service manager at Raceway Suzuki, owned and run by the guy that helped me build that very first XS650. Small world. Took an offer, 2000, to join the official Australian Suzuki superbike team as a mechanic, boring job, pull one engine out, put another one in. That was thelast year that we ran full spec FIM superbikes down here. All came straight from the factory. Got to look at the inside of one. It was not a 750cc engine.750cc was the limit. I know how big a 750 piston is. This was way bigger. Factory tricks. A mate working on the Yamaha team told me they had “fat” engines as well. How can privateer do battle with that??!! Season finished. We won the championship. No job. Tried working at a Ducati dealership. Didn’t “fit” into the Ducati thing and left after 3 months. What to do now? Start my own shop. Professional Motorcycle Tuning. I opened 1st Feb 2001. Best thing I ever did ! I have owned XS650s for most of the time, all roadster types (447), I don’t really like the special version. Too american for me. But hey, they pay the bills. I started doing a few engine rebuilds for a few people put ting a few of my little tricks into them. Word spread of what I can do. Terry (Toota) used to get the rephased pins done but his engineer retired, so now I do them. I am the only place in the world where they are available. I always have 2-3 XS650 engine rebuilds on the go. They vary from stock rebuild to big bore rephase and everything in between. XS1 is my favorite engine to do. Stronger cases, taller 1st gear and the head, all valve inspection covers the same. 3 bolt. Some people think it is a head off something else. 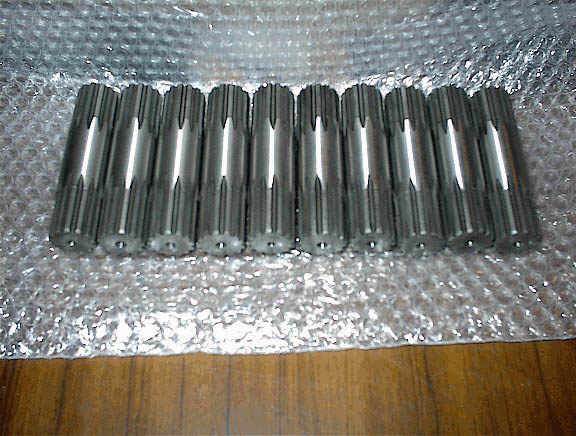 I am working one at the moment that is being de-stroked 6mm, down to 62mm, 256 conrods bushed to 20mm and an 81mm bore. 640cc.Rephased, what else? Got some titanium valves on the way from USA. Still waiting. Special cam, my dry clutch and high ratio primary gears. XS1 gearbox. If my math is right it should be able to spin to 10,500-11,000 RPM, piston speed 22m/sec. Bee-hive valve springs. Not that all hard to do, the secret is in the set-up.And the best bit, most of the parts are available across the counter. The guy that does my head porting is a whizz! Now, my awesome tracker is on the back burner for a while. Too much customer work on the go at the moment and I have my TX750s to play with. 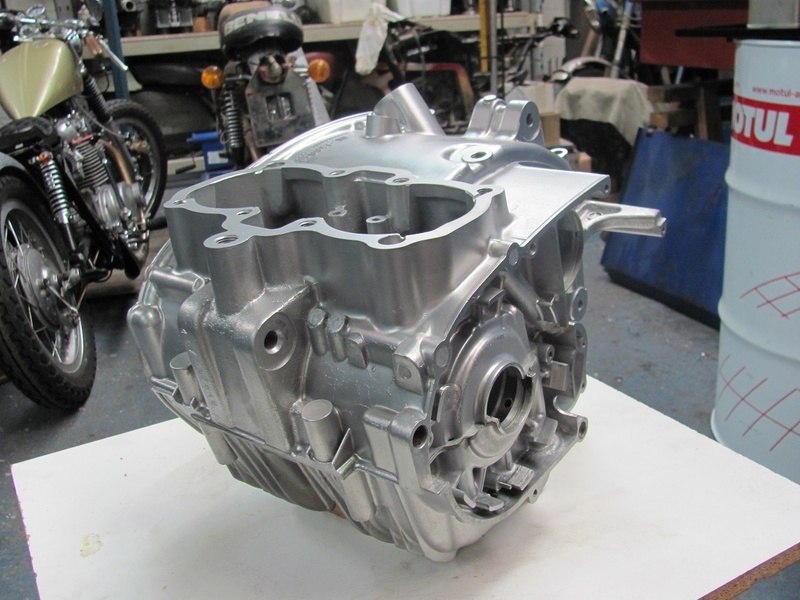 One thing I have been working on is an XS650 dry clutch. Just about got it done. After I do some testing (race track) on it I might start to do kits, costing ?? $3000-$4000.No one else does them. Someone in Japan does a kit for the SR500 every now and then. They areall sold out not long after being put on sale and they are a similar price. What else?? Yes, my belt drive. I am doing one for a customer at the moment. He now wants to fit a Motolana swingarm, 25+mm shorter than stock. I can’t cut and join a belt. Yet! Another spanner in the works. And he wants his stock one braced. A removable partwill have to be put in the bracing. I can do it. I can do anything. The belt drive? About $1000. Belts on Harleys last tens of thousands of kms so I can’t see a problem. I used to look after an XV1600A that in 100,000 km had only one adjustment. 750cc, 270 deg crank, Probe ignition, 34mm Mikuni carbs, TRX850 front end, Motolana SR500 swing arm, SR500 fuel tank, SR500 Nitroheads seat, and a lot of over the counter parts. 750cc, 270 degree crank, 34mm Mikuni carbs, Pamco ignition, header pipes that are way too big and loud (what the owner wanted) and extended swing arm. Total rebuild using mostly after-market parts, 650cc, std crank, 75 done up like a 74. 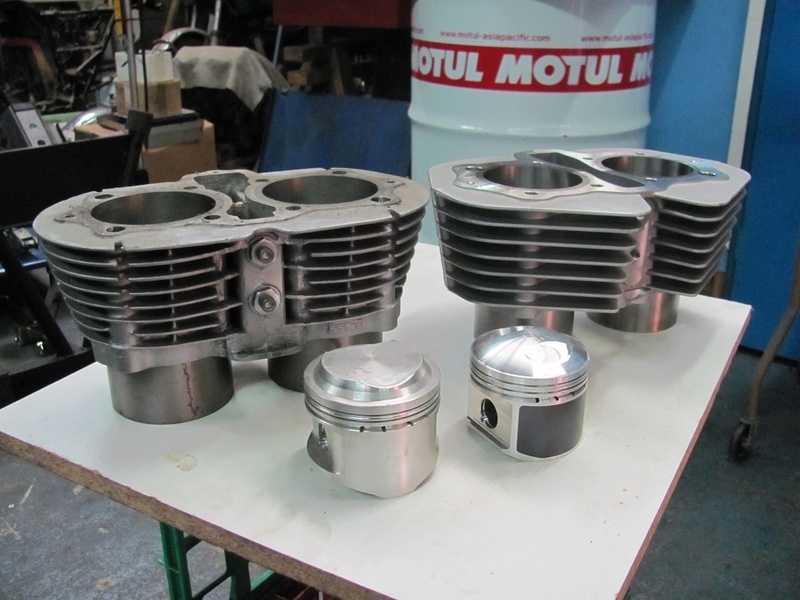 My 840cc piston with barrels, 85mm bore compared to Heiden’s 750cc barrels. My piston assembly is about 50 gram lighter. Daryl and his tracker – when will you get time to finish it? I don’t want to knock the original generating system. It has functioned for the last 40 odd years in one form or another. Designed to be in balance with the machine itself. And it has functioned. Mostly well. These are Hitachi-no GM here-and have mostly given dependable service. But then 40 years ago I was a teenager. Pumping. Today I’m learning my physical limitations. It has it’s shortfalls. Don’t you? If you’ve ever been stranded, using an excited charging system, with a weakened battery or worn brushes you’re going to start thinking the sun has to be shining. Somewhere else. Don’t get me wrong. They are not Lucas. Thankfully. But you’re still stranded. This topic has been thrashed by now. Over at the Garage, here and here or the Oz site or here. I remember this discussion starting up some years ago. There is a long thread at the Garage if you want to sort through it. It’s kind of interesting seeing it all develop. Here in Germany this mod has been done for a very long time now. Getting hold of the parts required is not as cheap as it used to be. This is basically a plug and ride mod. Will take a tech. novice with the parts and basic tools a morning to complete a points bike. A little longer for an electronic ign model. If your bike has a crank-based electronic ignition (TCI) you will need to swap this to a cam-based ignition (points, pamco…). This does introduce some timing errors associated with valve timing. Stretched cam chain, improperly dampening chain adjuster, cam lobe wear, valve wear, malfunctioning ATU etc will all directly affect cam-based ignition timing. But. Don’t worry. The points ignitions on all other XS650s are cam-based and they run just fine. If swapping from crank (TCI) to cam-based ign you will need to source the ATU-as above-if using points or Pamco. This is the shaft that runs through the hollow cam and the sprung weight mechanism on the rhs. The points or Pamco fit on the lh end. Make sure there are bearings or bushes. A good time to upgrade your coils too. There are several ways to do this. get or make a backing plate. Remove the pickup and extra wires from the stator. Pick up a Rectifier-Regulator. An original RD will directly plug and play. New is preferable. Find an RR from pretty much any late model high revving sports bike running a PMA. Some will have 5 wires, some 6, some 7. The colour coding will differ with brand too. If running without a battery, connect the voltage sensing wire, typically Black on Honda, Orange on Suzuki, and Brown on Yamaha and Kawasaki to the positive output wire. If running a battery connect after the ignition switch so it’s live only when the key is on. Just found this http://www.gofastforless.com/junk/Per-Mag-Alt-Instructions.pdf which deals with the topic fine. You can run this batteryless using a capacitor…25V and 10K uF. I’ve done this for quite some time now with no problem, however I get a little nervous sometimes wrt reliability. I am about to add in a small gel battery. If my alternator stops charging my Pamco requires so little current I will still get home. As I say, apart from a slight risk running batteryless I like this. After adding a battery I will feel good. It’s a bit lighter, allowing slightly freer revving. For track purposes however a total loss system makes things even easier. One more point here. These girls are starting to show their age a little, mostly gracefully. Personally I distrust the complete electrical system and usually take this chance to rip the lot out. I then fabricate my own simplified wiring. Doesn’t take long, reduces weight, makes space and you know what you’ve got.